I was free for the last four days of July 2015. Time to treat myself to a vacation trip. Considering the summer heat, it seemed prudent to head north. But whither? Maybe to Michigan. I recall 20th-century trips with my parents and aunts and uncles, and perhaps it was time to revisit those places  in particular, Dearborn and Frankenmuth.  Dearborn is the site of the Henry Ford Museum and Greenfield Village, now known collectively as The Henry Ford. I had been to the Museum several times but had never entered the Village, a themed collection of old landmark buildings from the eastern USA such as Thomas Edisons laboratory. 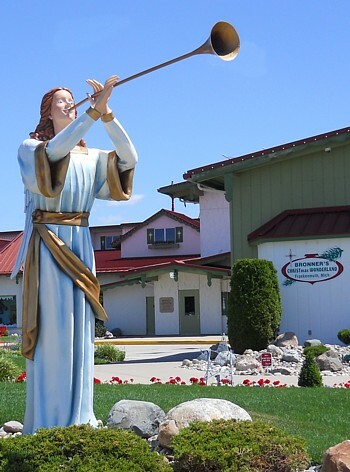  Frankenmuth is the site of Bronners Christmas Wonderland, the worlds largest Christmas store. Its a town founded by Germans, and I have some German heritage including my fathers great-grandfather George Frederick Schöll, who immigrated from Heidelberg, and my mothers sister-in-law Esther Rauschenberger, who grew up in Ann Arbor. I left Pennsylvania in the morning, driving towards Michigan. Oberlin College, where I studied German as part of my physics major many years ago, was near the halfway point. I paid a brief visit. A new hotel has been needed there for a long time. I remember staying at the Oberlin Inn for the WOBC reunion in 1988, and even then it was out of date. A replacement Inn is finally under construction on the corner of College and Main. Continuing west, I headed for the Detroit airport. The Henry Ford is ten miles from downtown, but I had decided to stay a little farther out, adjacent to the airport at the Fairfield Inn in Romulus. There was a strip mall next door with a café called the Beirut Restaurant. There arent many Middle Eastern places where I live, so I decided to give it a try. 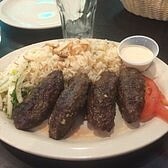 I had lentil soup and shish kafta (enlongated meatballs including onion and spices) with garlicky tahini sauce. Tasty! It was going to be a hot day, so I decided to visit Greenfield Village first, in the morning, followed by the air-conditioned museum in the afternoon. Below we see the family farm of Henry Fords friend Harvey Firestone (the tire tycoon), transplanted from Columbiana, Ohio, to Dearborn, Michigan. 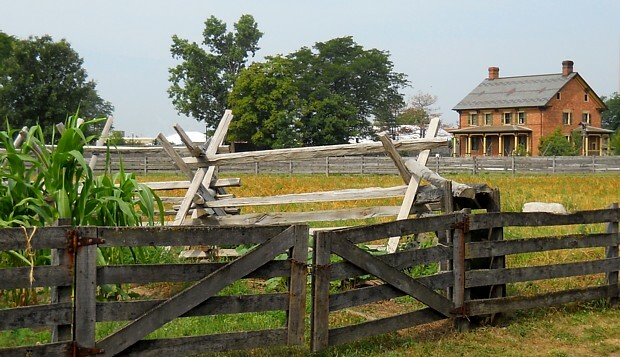 Ford relocated nearly 100 historical buildings, recreated others, and arranged them in a village setting. Click here to see a photo of a transplanted antebellum fabric mill. 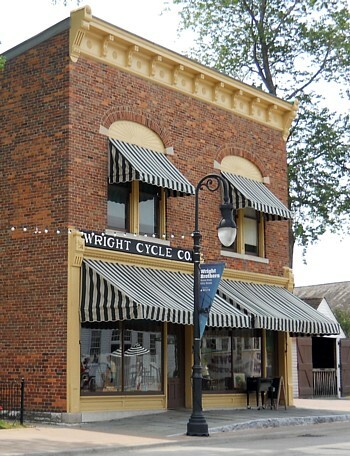 On the left is the Wright Brothers original bicycle shop from Dayton. I hadnt realized that their business occupied only the left half of this building. The Wright home is now located next door to the bicycle shop. 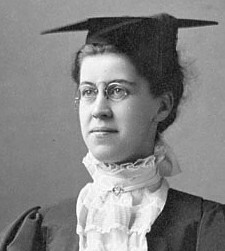 A sign notes than Wilbur and Orville never attended college, but their sister Katharine did, a rarity for women back then. What it doesnt mention is that she went to Oberlin! The college was later remembered in Orvilles will, and I studied in Oberlins Wright Physics Building. Across the street is the home of H.J. Heinz, the Pittsburgh pickle king. This house originally stood in Sharpsburg, Pa., just 13 miles down the river from my current residence. It was here in his parents basement that Mr. Heinz started bottling horseradish in 1869. 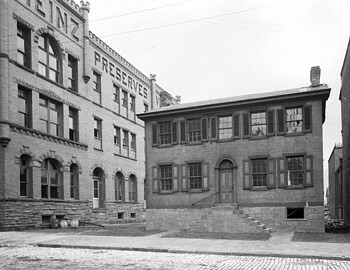 The buildings first move (right) was to the north side of Pittsburgh in 1904, where it became a museum on the grounds of the Heinz plant. 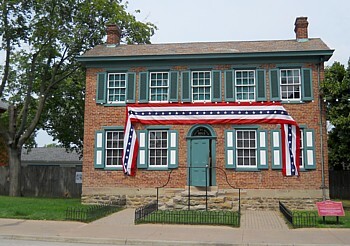 Half a century later, the company donated the house to Greenfield Village. A steam-powered train circles the grounds. Near the roundhouse hangs this ten-foot iron triangle. 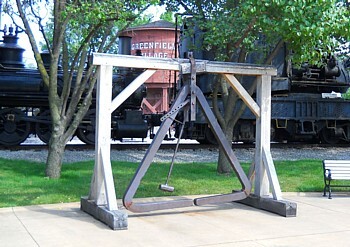 Im guessing it was used as a dinner bell for men whod been working on the railroad all the livelong day. What would it sound like if rung? Time for a bit of physics. A triangle produces an indeterminate mixture of pitches, but if a little silver orchestral triangle sounds a ting two octaves above middle C, this instrument thats 24 times as large would sound a bong two octaves below. I wouldnt want to be the percussionist required to play it by releasing the sledgehammer. Also, students, the pendulum wont swing far enough to the right unless we first pull it all the way to the left before we let it go. Even then, the hammer actually makes contact with the triangle only because its right side B is a little longer than its left side A. Having strolled around for three hours or so, I was hot and tired. I decided I could skip the museum that afternoon and catch it on my return trip Friday. So I headed north through a rainstorm in Michigans thumb to my next Fairfield Inn in Saginaw. For supper that evening, I selected the yellow perch. This freshwater fish seems to show up only on menus in the Great Lakes area. I had enjoyed perch as part of Friday fish fries when I lived in Ohio, and I was glad to taste it again  sweeter than the bland codfish we get in Pennsylvania, with a spicier breading. Tasty. 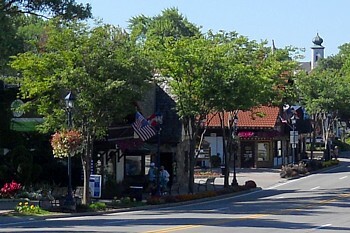 Frankenmuth was founded by Rev. August Craemer and 14 other Lutherans from Franconia. Thats in the southern part of Germany, mostly in Bavaria. When the settlers arrived in Michigan in 1845, they were advised by the pastor of Ann Arbors German colony, Rev. Frederick Schmid, to proceed north to this place on the Cass River, where they could preach to the Chippewa Indians. 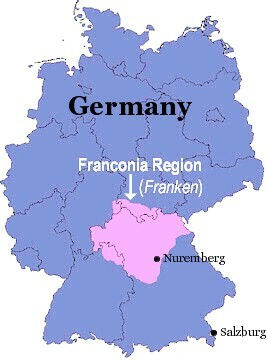 The Michigan folks would pronounce their town Fronkenmoot if they still spoke German. They dont, but theyve installed Bavarian timber-framed architecture everywhere, from car dealerships to the Postamt (post office). After ambling up and down Main Street, I decided to dine at a slightly out-of-the-way spot called Sullivan's Black Forest Brew Haus & Grill. Sullivan is Irish, of course. There were few German dishes on the menu besides a sausage sampler. I dont think a Reuben sandwich counts, despite the sauerkraut; its an American invention. I settled for the chicken schnitzel. The more widely-known Wiener schnitzel was not among the offerings, an omission which my mother would have approved. Wiener schnitzel is made from veal, or calves meat, and my farm-raised mother disapproved of the cruel treatment that veal calves suffer. My chicken schnitzel was battered and served with butter and capers. Tasty. Behind the bar, a TV was showing the noon newscast from WNEM, the CBS affiliate in Saginaw. I noticed a couple of oddities. 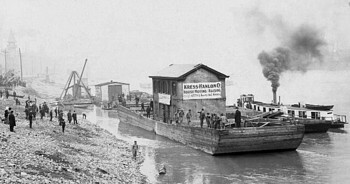 One news story concerned the Amycita, a hundred-year-old kit boat from Bay City that was returning to a local museum. This story aired live and direct from the reporters cell phone. He aimed the phone at himself to begin the report, then turned it around to show us a couple of workers. There was much bouncing of the picture. Live is attention-grabbing, I guess, but its rarely necessary. I would have much preferred a professionally-photographed taped report. Maybe it could have even included a shot of the entire boat. Then when the newscast ended at 12:25, it was followed by a link to ObitMichigan.com and three minutes of obituaries. Several names appeared on the screen, wiping to the next page after a few seconds. I remember such noontime broadcasts years ago sponsored by funeral homes in two small Ohio cities, on radio stations WILE in Cambridge and WMRN in Marion. On the latter, the list of the deceased was read by the lugubrious undertaker himself. But Saginaw is five times as large as Cambridge, with a TV station and everything  too sophisticated for daily obituaries, youd think. Frankenmuths greatest tourist attraction was founded exactly a century after the town itself, when Wally Bronner opened his Christmas Wonderland in 1945. This store is a great place to shop for holiday decorations because its very large  more than seven acres under roof  and because its open year-round. On the south end of the grounds, Wally erected a replica of an octagonal chapel in Oberndorf, Austria, near Salzburg, which is almost in Bavaria (just across the Salzach River). 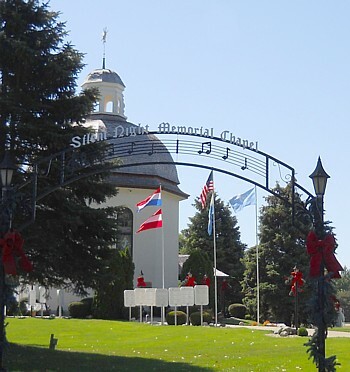 The Oberndorf chapel marks the spot where the carol Silent Night was first performed on Christmas Eve in 1818. This replica is encircled by signs bearing the words in 316 different languages, by my count. I had to buy something at Wally World. The Wonderland offered every kind of ornament, from dinosaurs to Twizzlers, and much more besides. I brought home this St. Nicholas. Just to be different, I chose a Santa wearing a blue robe. And, because I dont erect an actual Christmas tree in my apartment, I also bought a lighted ceramic tabletop tree. Ill take it out of the box in a few months. And so I departed Frankenmuth. Driving north, I was almost ready to turn left and return to my hotel in Saginaw. But what was that white tower in the distance ahead? It was moving! It was a giant windmill, a turbine for generating electricity. And I noticed another one to the left. I recalled the previous fall in northern Ohio, where I saw one single solitary wind turbine near Lake Erie. 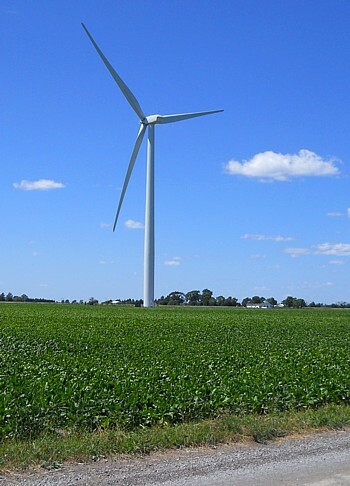 Here in Michigan I had discovered a veritable wind farm. My faithful Subaru and I said one to another, Let us now go even unto Bay County and see this thing which is come to pass. I continued to drive straight north on Gera Road toward the windmills. It took longer than I expected. They were large and distant  almost half as tall as the Washington Monument. Five miles later, I finally arrived at the field office of NextEra Energy Resources. Here, within a thousand yards, were not one, not two, but five wind turbines, each with three 150-foot blades rotating at 10 or 12 rpm to generate as much as 1.6 million watts of electricity. Then I turned my eyes to the right and beheld many more such turbines on the horizon. There were more than I could count. They extended as far into Tuscola County as I could see. A check of Google Earth showed that this forest continues northeast through farmers fields for at least 18 miles. NextEra says it owns 134 turbines in the area, generating enough electricity to power 90,000 homes (as many as there are in all of Saginaw County). And it may add more. Its a revolution. Coal mining, long important to southwestern Pennsylvania and nearby West Virginia, employs 93,000 people who say their old-fashioned livelihood is vanishing because of a war on coal. Meanwhile, the wind industry has created 77,000 new jobs. And the real wave of the renewable energy future seems to be not wind but solar, which already employs 174,000. On the final day of my vacation, I arose early and headed south again, in order to be on hand when the museum opened at 9:30. Passing the city of Flint, I noticed a sizable hill beside US 23. Thats odd; such hills are not indigenous to this part of Michigan. Looking closer, I saw earthmoving equipment crawling across the bare dirt. Where I come from, this might indicate a coal mine, but these machines werent taking coal out; they were putting garbage in. Further research identified this as the Citizens Disposal landfill, which since 1989 has covered more than 300 acres with a million cubic yards of waste. Every day, a hundred trucks bring in another 2,000 tons of trash from six counties. Methane wells collect the noxious gas and turn it into electricity. In Dearborn, I remembered the Henry Ford Museum as a rather overstuffed collection of obsolete devices, as seen in these images from my 1973 visit. There were galleries of steam engines, rows of typewriters, examples of vacuum tubes, and so on. Antique cars were lined up bumper to bumper. But the place has been much improved lately. The collections have been pruned, interactive video screens have been added to instruct the children who visit, and the floor even includes some open areas. By the way, I always liked the 1955 Chevrolet in this unusual color combination, shadow gray over coral. You dont see that nowadays. The collection includes a few reproductions, but even they are antiques. 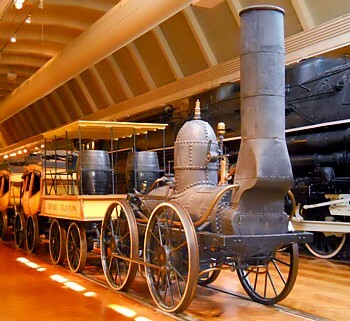 The original DeWitt Clinton locomotive pulled the first regularly scheduled passenger train from Albany to Schenectady in 1831. This replica was built for the 1893 worlds fair. 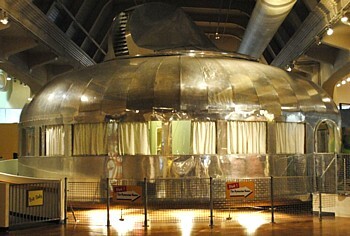 A smaller building is featured within a back corner of the museum: the round Dymaxion house designed by Buckminster Fuller. 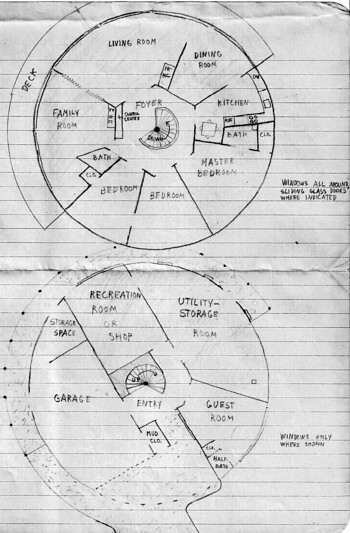 He planned to take advantage of the housing boom that followed World War II by building this modern yurt in an underused Beechcraft aircraft factory in Wichita. Made of aluminum, it reminds me of a giant Airstream travel trailer. But it includes some clever design elements. There's a semi-open floor plan. 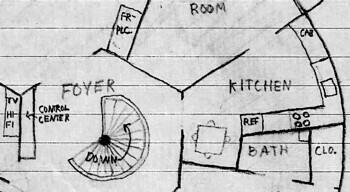 Three identical rectangular partitions contain both closets that revolve and stacked shelves that ovolve (Bucky's word). 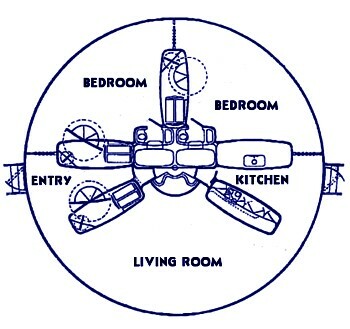 In the corner of each bedroom, a little aircraft-sized bathroom with tub is wedged into the center core of the structure. The domed ceiling is brightly lit to provide indirect illumination to the whole house. Any rainwater that seeps through the ceilings seams is wicked down into a cistern. 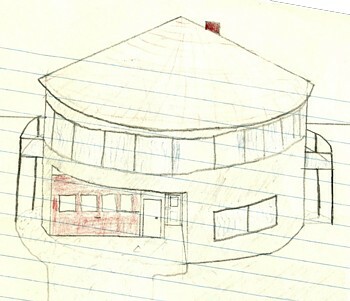 When I was in junior high I drew a design (right) for a circular house like Bucky's, but with two stories. The top floor, with glass all around, would have had great views when the drapes were open. 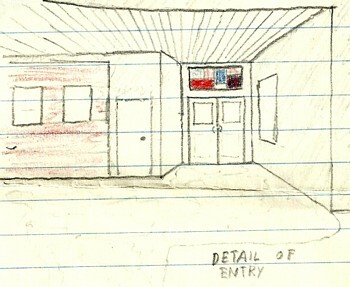 I even sketched a perspective of the steps on the circular staircase. Although closet space was minimal, I did include a control center for the home's electrical and electronic equipment. Each major room had windows or sliding glass doors, but only on the circumference. 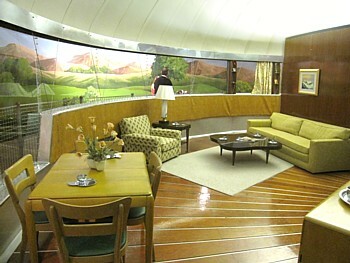 Well, the Dymaxion house doesnt have that problem. Theres a ventilator on top of the roof, where a vane turns it to catch the wind. The windows are sealed, but wall panels below the windows drop down to reveal screened openings. The problem that I did see: a complete lack of insulation. 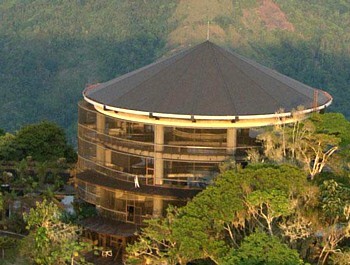 A modification of my design, slightly upgraded, has been built in Costa Rica. Boracayan has plenty of cross-ventilation. There are no windows and no walls. During my week of strolling about, I learned that after about 2½ hours my legs begin to get tired, specifically my calves and feet. So on this final day I skipped the exotic tasty food and grabbed a hot dog at the museums snack bar. Then I embarked on the final 330 miles of my adventure, the drive home. It was dark by the time I reached Pennsylvania, but through my windshield I watched the rising of a blue moon (actually orange) while listening to the Pirates game. It was time to rest. But my leg muscles didnt know that. Having become accustomed to exercise, they asked me, What are we going to explore today? Ill have to remind myself to do more walking.